RC Willey features a charcoal black 3 piece modern entertainment center from the Del Mar Collection. If you want a modern look, plenty of storage space for your media collection, and display space for your family photos and prized possessions, then this entertainment center is perfect for you! You will find this 60 inch Charcoal TV Stand from the Del Mar collection at RC Willey. This streamlined piece features an open component compartment, media storage with protective glass doors, adjustable shelves throughout, metal hardware with brushed aluminum finish, and cutaways for wire management. 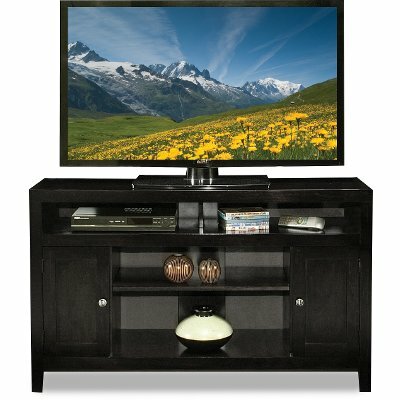 Charcoal Black 3 Piece Modern Entertainment Center - Del Mar is rated 5.0 out of 5 by 2. Rated 5 out of 5 by BudEBear10 Modern Looking Unit We were looking for one with extra storage, not too tall, sturdy, easy to move around and with no heavy bridge top piece to put on top. This entertainment center fit the bill. It has a wood grain pattern and the color is between Expresso and near black. Happy with this unit.